Schematic representation of interaction of Ac1–9 with I-Au and the Tg4 TCR. The I-Au peptide-binding cleft interacts with position Lys4 and Arg5 of Ac1–9. The stability of this interaction is extremely poor but can be enhanced greatly by substitution of Lys4 by Tyr. Positions Pro6 and Gln3 act as primary and secondary contact residues, respectively, for the Tg4 TCR. Any substitution at position 6 ablates T cell activation, whereas APL with Met, His, Phe, or Tyr at position 3 act as weak agonists. This information is derived from previous studies (14–17). Fine specificity of Tg4 T cells determined using Ac1–9 position 3 and position 6 APL. Naive Tg4 splenocytes (open bars) and the Tg4. TCL (filled bars) were tested for proliferative responses to Ac1–9 APL with all possible substitutions at position 3 or position 6. Relatively high Ag concentrations were used (20 μM shown here), and proliferation is expressed as mean cpm of triplicate cultures. These experiments were repeated with consistent results. 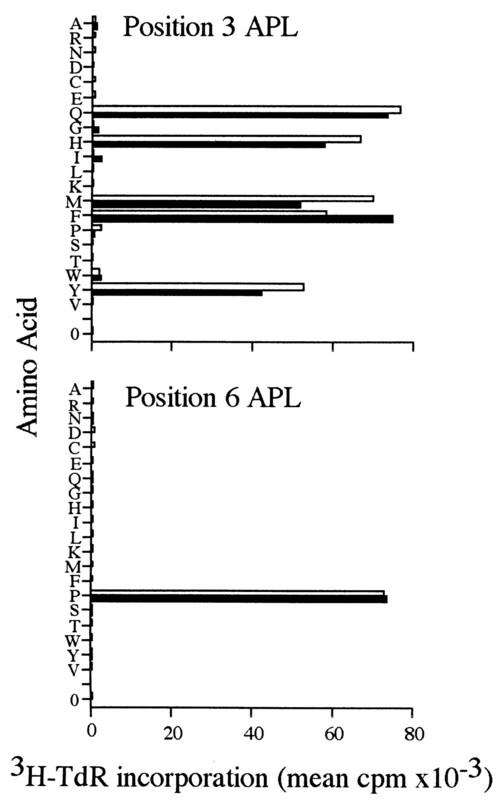 Ac1–9 position 6 APL can act as antagonists for the Tg4 TCR. Ac1–9 (4Y, 6X) APL were tested for inhibitory effects on proliferation of Tg4.TCL in response to a suboptimal dose of Ac1–9(4Y) (0.5 μM). All position 6 APL were tested. 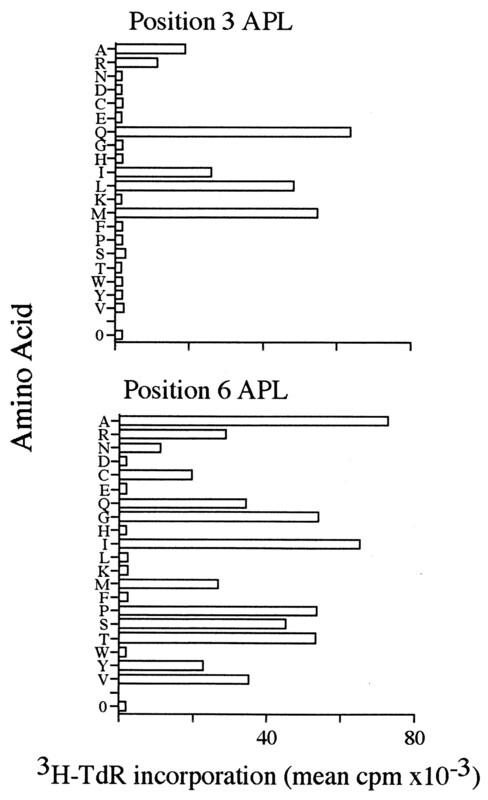 Shown here are the five APL showing inhibitory effects and the null peptide Cys6 as an example of the ineffectiveness of all other APL tested. The 323–339 peptide of OVA was used as an I-Au-binding control peptide. The response of Tg4.TCL to Ac1–9(4Y) in the absence of APL was 49,326 cpm (mean of triplicate cultures). This experiment is representative of two additional experiments with similar results. 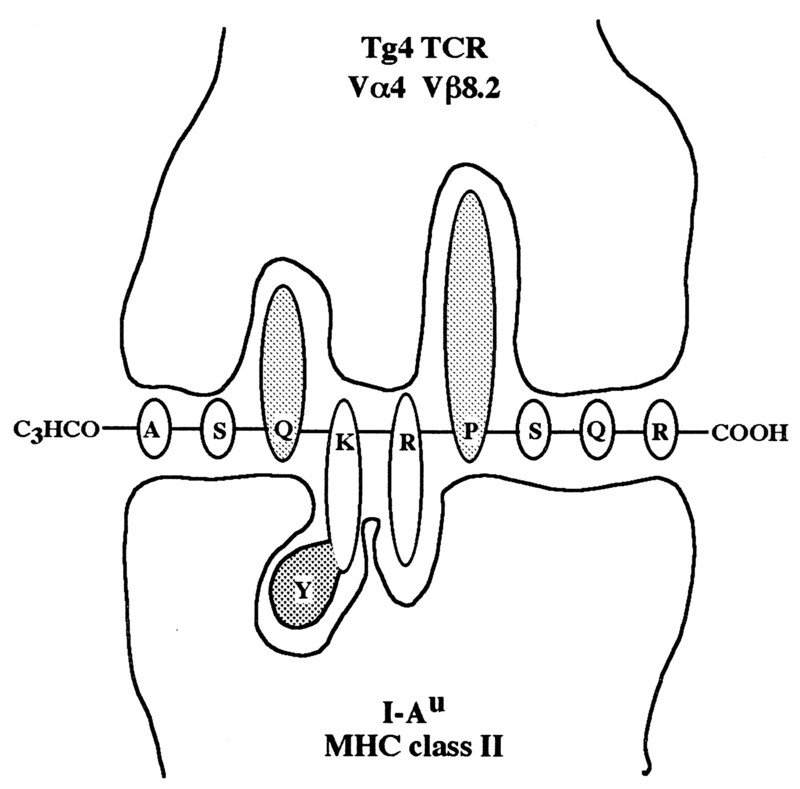 Fine specificity of polyclonal Ac1–9-specific TCL differs drastically from that of the Tg4 TCR. The 4Ku.TCL and 4Kuxs.TCL were derived from H-2u and H-2uxs mice, respectively. Both TCL were tested for proliferative responses to Ac1–9 APL with all possible substitutions at position 3 or position 6 (20 μM). These experiments were repeated three times with consistent results. Ac1–9 position 6 APL that antagonize the Tg4 TCR fail to antagonize polyclonal Ac1–9-specific T cells. The response pattern of 4Kuxs.TCL to Ac1–9(4Y, 6X) APL was analyzed in terms of responses to APL alone or the ability of APL to influence responses to a suboptimal dose of Ac1–9(4Y) (0.5 μM). 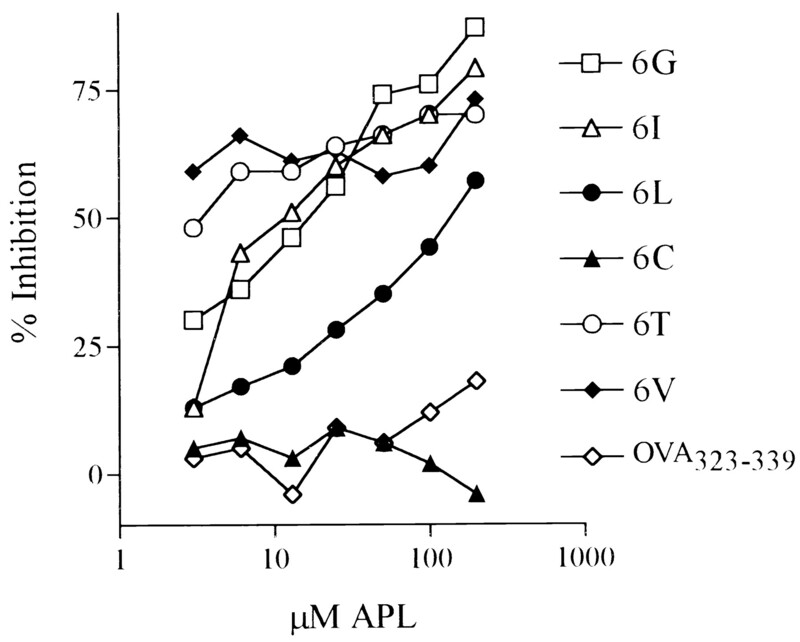 APL were added to cultures at 50 μM and assayed after 48 h. The 323–339 peptide of OVA was used as a control. The MBP TCR1 transgenic TCR shows remarkable flexibility for Ac1–9 recognition at positions 3 and 6. Naive splenocytes from MBP TCR1 transgenic mice were tested for proliferative responses to Ac1–9 APL with substitutions at position 3 or 6 (50 μM). This experiment was repeated twice with consistent results. a The I-Au-binding affinities of Ac1–9, Ac1–9(4Y), and position 6 APL, previously identified as antagonists of the Tg4 TCL, were compared using a competitive binding assay. As controls, the null Cys6 APL and the OVA323–339 peptide were also tested. a Ac1–9 APL were compared with wild-type Ac1–9 for the ability to induce EAE in Tg4 transgenic mice or mice of the EAE-susceptible B10.PL and B10.PL×SJL strains. Each mouse received 100 μg of the indicated peptide. In Expt. 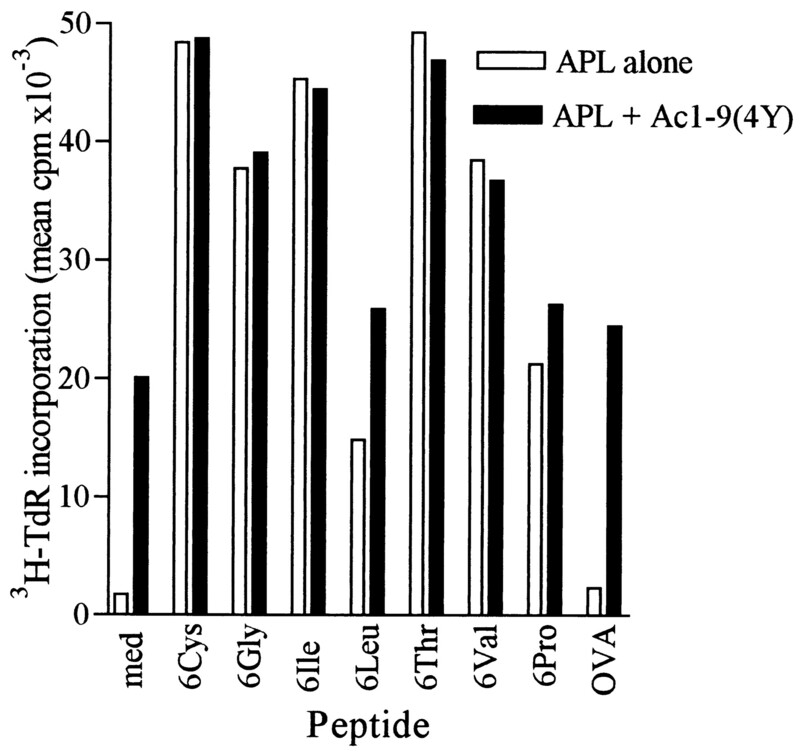 1, APL with Tyr at position 4 were used, whereas Lys4 APL were used in Expt. 2. Results are shown as incidence of EAE onset with the mean of the maximum score reached by each mouse in a given group shown in parentheses. a The response patterns of Tg4 T cells, polyclonal TCL, and MBP TCR1 transgenic T cells to position 6 Ac1–9 APL are shown. In each column, + and − represent the presence or absence of agonist activity, respectively. The position 6 APL with Tyr at position 4, which acted as antagonists of the Tg4.TCL, are also shown. b The Val6 APL with Tyr at position 4 behaved as an antagonist of Tg4.TCL at low concentrations, but was stimulatory at high concentrations. The Val6, Lys4 APL did not stimulate Tg4.TCL.